I am excited to introduce a new series of my blog called 'Getting to Know the Makers'. Here I will be interviewing various artists and makers who create the products we stock at Windy Peak Vintage. Whether it is a lovely wall hanging, a minimal dress, a coffee mug, or a market bag, learning about the artistic process and intense passion the makers hold gives us a deeper connection to these goods. My first interview is with the lovely Alayna Rasile-Digrindaki of ABSORKA. Absorka is a collection of one-of-a-kind clothing handmade by Alayna in Helena, Montana. Alayna is a designer and textile artist with a creative process that is both intuitive and exploratory. Absorka clothing is always made of natural fibers, plant dyes, and various reclaimed and vintage materials. What inspired you to start Absorka? I describe my clothing line Absorka as ‘intuitive and exploratory’ because each item is an artifact of experimentation. I’ve always been very material oriented – and making clothing has been a way for me to discover material and explore various manipulation processes. My pieces combine reclaimed, often vintage, fabrics with labor-intensive handwork like handmade porcelain buttons, hand-painted designs, and hand-woven cloth. When you are an obsessive maker you start to accumulate a lot of things –Absorka is my avenue to share these textiles with people who appreciate their unique stories. How did you learn to work with textiles like you do? I believe that textile work comes from somewhere deep in my DNA. My great-grandmother crocheted lace, my grandmother was a weaver, and I grew up around my mother sewing, spinning, and knitting all the time. 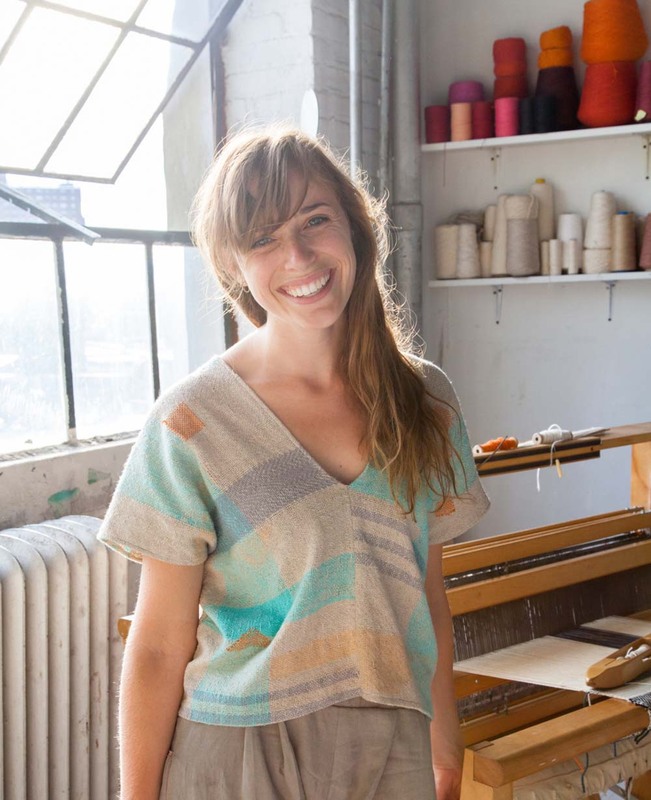 During the years I lived in New York City I worked for some amazing textile artists/designers like Erin Considine, Emily Fischer of Haptic Lab, and Tyler Hayes of BDDW. Most of my formal learning, though, came from a year-long residency at the Textile Arts Center in Brooklyn. How has your work evolved with time and what do you see for the future of your shop? I’m always switching between mediums, influenced by the materials, space, and equipment that are available to me. Every day I work in my studio I learn more about craftsmanship – perhaps making clothing is so addicting because I am constantly building proficiency and each piece comes out better than the last. For the most part, I’ve stepped away from my loom for the past year to really go deep with my sewing machine. As for the future… I want to do a collection of menswear, and I recently acquired a knitting machine – so maybe you will see some adventures in knitwear by next winter! How does nature influence you as an artist? I use natural dyes and natural fibers, which lend themselves to a specific color pallet that channels the landscape of the Inter-mountain West. For the first five years of my art practice I lived in huge cities on the east coast – this pallet brought me closer to my Montana roots. Now that I’ve moved back west and am working in an off-the-grid studio in the mountains - I feel fully integrated into a ‘nature-based’ existence – and I think my work shows it. Another way I feel influenced by nature is by making choices in the interest of environmental protection. I use mostly reclaimed materials and do a lot of piecework with my scraps- aiming to have as little waste as possible. The textile industry is one of the top sources of pollution in the world. My motivation to make clothes comes from the desire to hold complete responsibility for how they are made. I believe that part of the mission of an independent, small-scale designer is to have a deep awareness of how we ‘consume’ textiles and enable others to make choices that will balance out the destruction of the ‘fast-fashion’ industry. You can find some of Alayna's one of a kind pieces in the 'Handmade + Independent' section of the shop. And also on her website / social media.